Table of Contents Next: Ginder, Samuel P.
Dimensions 426' by 58' by 15'6"
The Gilliams were completed from 1944 to 1945. 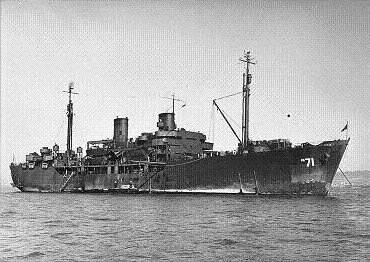 They were produced by the Wilmington yard of Consolidated Steel Corporation under contract to the Maritime Commission as standard type S4-SE2-BD1 ships. Intended from the start for military use, they were small, had shallow drafts, and were designed to carry large amounts of combat equipment along with their passengers. Landing craft complement was 13 LCVP, 1 LCPL, and 1 LCPR. The last of these ships was completed three months ahead of schedule.